On a beautiful afternoon in Beaver Oklahoma Saturday April 16th a large crowd of participants competed in the Annual Cow Chip throw at the Beaver Fairgrounds. Contestants from as far away as Chicago, Tulsa and even Maryland "Slung Dung" with area residents. In the team Division Lipscomb Land and Cattle took 1st place with a combined throw of 249’*8". In second was Lickety Split, followed by the Forgan Fire Department. In the Women’s Competition, Terri Welty was once again crowned champion with a throw of 105’3". 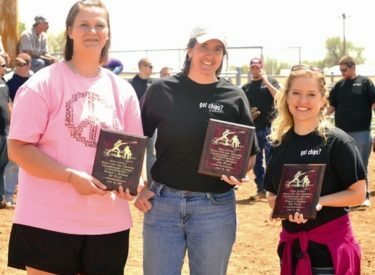 Taking 2nd was Dana Martin, a counselor at Guymon High School, followed by Laura Frazier from Maryland. For the Men, John Elfers was victorious throwing his chip 145’11" defeating James Pratt who took 2nd, while Mark Tillman was in 3rd. In the VIP Division Rob Collette, a former baseball player for the University of Tulsa and camera man for News Channel 8 out of Tulsa, took 1st with a throw of 122’5". In second was KSCB/The Legend’s Joe Denoyer, and in 3rd was an anchorman with News Channel 8, Bert Mummalo. A lare number of spectators filled the grandstands to watch the competition.